And apparently, millennials who use the RobinHood free stock-trading app have taken this advice to heart. According to Business Insider, shares of Aurora Cannabis, the Canadian cannabis producer, are now more popular among the app's (mostly millennial) users than Apple. That's not to say millennials aren't absolutely enamored with Apple products (they are). But the bubbly "green rush" into marijuana stocks is more in keeping with the get-rich-quick ethos favored by their generation than the traditional buy-and-hold approach associated with owning a blue-chip stock. Aurora Cannabis is now held by 247,517 Robinhood users, up more than 20,000 from last week. The marijuana stock outranked all the others on the app, including Apple, which had maintained its top-ranking position since the week of November 8. The smartphone giant's stock now ranks second in terms of Robinhood ownership, at 237,050 shareholders. After shares soared in trading on the Toronto stock exchange following reports that Coca-Cola was looking into a deal with Aurora to produce CBD-infused beverages, Aurora went public on the New York Stock Exchange in October. 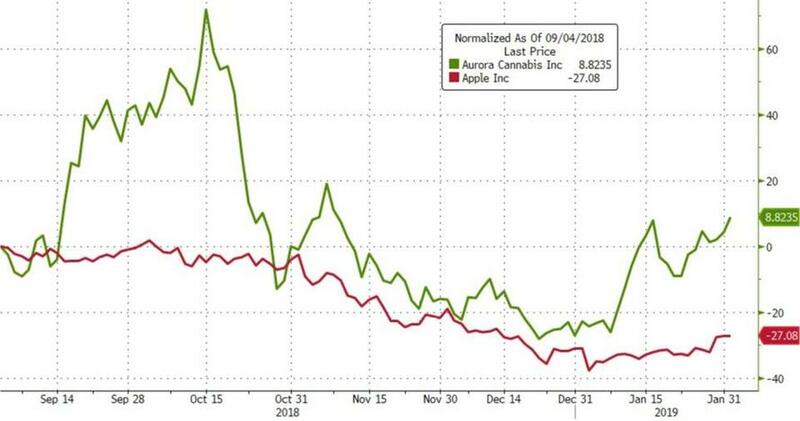 Since then, Aurora shares have outperformed Apple shares by a wide margin, even as the January recovery lifted tech shares out of the doldrums. Last month, Aurora told BI that it's planning to introduce hemp-derived CBD products after the latest Farm Bill legalized hemp. The company is focused on expanding its reach in the US, where the regulatory environment is rapidly becoming "more favorable for marijuana producers."